Pacific Northwest horticulturists have produced their fair share of choice plants. The 'Bing' cherry, for example, comes from Oregon. So do 'Marion' berries. All the 'Kenora' dahlias are from Washington, as are the 'Camano' and the 'Fidalgo' dahlias. The region has also produced famous rhododendrons, lilies, roses, and fruits and vegetables. A few of them have become household names, at least to gardeners. Some of them are among the finest of their kind ever introduced to horticulture. Plant introductions began in the late eighteenth century, when 'Haida' and 'Ozette' potatoes arrived on the voyages of explorations. They were the first, but many other fine plants followed. Oregon Trail horticulturists developed a wealth of tree fruits, most notably cherries, apricots, and plums. They also developed new vegetable varieties, though they have since disappeared. Judging from early records, some of these old-time varieties were intriguing. At one time, for example, blue potatoes were apparently common in Oregon. So was a "self-fluffing" potato that burst when it was baked. Later generations began tinkering with ornamentals, developing fine varieites of flowers and shrubs, and introducing some particularly nice landscape trees. The work continues. Northwest horticulturists are still developing new varieties of fruits, berries, vegetables, and ornamentals. Although most of the plants on this list are still available in the trade, a few have disappeared. I have included them here for two reasons. First, they are historically important. They offer a glimpse into what gardeners in the past grew. Some are also important horticulturally, contributing unique genes to cultivars today. By 1913, the Oregon Nursery Company, which was founded in 1867, was an enormous operation. Covering 1,200 acres near Hillsboro, Oregon, it was once the largest nursery in the West and possibly the country, or so its owners claimed. Over the years, the nursery introduced several new varieties of fruits, nuts, and berries. One of the most famous was the 'Orenco' apple. The company's 1913 catalog called it "the ideal dessert apple," and noted that this plump, red apple was "crisp, tender and juicy, with a very small core." The flesh was mild and sweet and had a pleasing aroma. This apple was so good, or so its producers claimed, that it was better than even the 'McIntosh Red' or 'Spitzenberg,' two apples that once set the standard for quality. Today, the 'Orenco' apple survives. Nurseries that specialize in heirloom varieties still offer it. Oregon Nursery Company, Descriptive Catalogue of Fruit and Ornamental Trees, 8th ed., Orenco, Oregon: Oregon Nursery Company, 1913. In 1859, Stephen Maxson, Sr. came west on the Oregon Trail, bringing a bag of appleseeds. He settled about six miles east of Walla Walla, and planted the seeds. One of them grew into a trees that produced particularly fine apples. One nursery catalog described them as follows, "Largest apple known, a prodigy for size; of extraordinary beauty...; flesh crisp, juicy, rich with a delicious, high flavor. Unsurpassed for cooking and drying; a very long keeper..."
The 'Spokane Beauty' was something of a phenom. Judges awarded it first prize at the Spokane Fruit Fair in 1895 and 1896. Today, it is still available, but it has fallen from favor. The tree tends to set fruit that are lopsided and even misshapen. And what was once considered a selling point is now a flaw --consumers now think these apples are just too big. Grace E. Miner, A Century of Washington Fruit , Master's thesis, University of Washington, 1926. Tasty beans grow a foot long, and stay tender and tasty. A pole bean with a delicious flavor, 'Oregon Giant' produces huge green beans that are still tender and nearly stringless when they are more than a foot long. Picked young (and with these beans, that means at twice the size of ordinary beans), they are sweet and flavorful - an excellent snap bean. Left to mature, 'Oregon Giants' are popular as shelly beans. What is less well known about them is that 'Oregon Giants' will germinate in cold soil (some claim they will even germinate in mud). Because they will grow when other beans rot, gardeners can plant them early and harvest them long before other pole beans are ready. This variety, which is now endangered, dates at least to the 1920s, and perhaps earlier. The Portland Seed Co. listed it in 1921, calling it 'Dickenson's Yount.' Their description explained that "The origin of this bean is unknown but it has been planted in home gardens in Oregon for many years and the fortunate few who have obtained seed consider it the best bean for table or canning green." Today, this old-time bean has largely disappeared, shunned by consumers who think the giant, speckled pods must be tough and woody. Astute gardeners know better, enjoying a mighty tasty bean that thrives in the maritime Northwest. Portland Seed Company. Complete Seed Annual. Portland: Portland Seed Co., 1921. A wonderful heirloom pole bean, 'Gramma Walters' has speckled pods that contain the most unusual beans. They have a plump, blocky shape, but what makes them memorable is their colors. Some are solid maroon. Others are speckled maroon on white. The two kinds appear on the same plant, even in the same pod. Growers never know exactly what the beans will look like until they open the pods. 'Gramma Walters' is an early variety, one that is ready to use in 65-80 days. It is even reliable in the maritime Northwest, where cool summers often make growing dry beans iffy. Cooks use 'Gramma Walters' beans dry, in some of the same ways that they use kidney beans. Experts are not sure who Gramma Walters was, or when she developed these beans. About all we know of her is that she lived somewhere in Eastern Washington. Kent Whealy, Joanne Thuente, et. al. Garden Seed Inventory, 5th ed., Decorah, IO: Seed Savers Exchange, 1998. The best blackberry in the world? In the early 1940s, plant breeders at the Oregon Agricultural Experiment Station, with help from their colleagues at the USDA set out to develop a new blackberry. They wanted one that tasted as good as the wild trailing blackberry, Rubus macropetalus , but that was more productive. They researched the best berries of the time, and selected varieties that were the most promising, 'Chehalem' and 'Ollalie.' In 1945, they made the cross. After selecting the most promising seedling and studying it in field trials, they knew they had a winner. In 1956, they named this berry the 'Marion,' after Marion County where growers had tested it. George F. Waldo. The Marion Blackberry. Circular of Information 571, Agricultural Experiment Station. Corvallis: Oregon State University, February, 1957. What Frangoes are to chocolates, the 'Olympic' is to blackberries--an exquisitely tasty bit of local lore. The 'Olympic' hails from Vashon Island, developed in the late 1920s by Peter Erickson and his son-in-law, H. F. Grieder. Erickson, who was inspired by Luther Burbank, wanted a blackberry reminiscent of the blackcap raspberries native to his childhood home in Canada. By crossing Luther Burbank's 'Phenomenal' blackberry with a blackcap raspberry, Erickson developed the 'Olympic.' The fruit, said to be nearly 2 inches long in exemplary specimens, was sweet and juicy with a memorable flavor. Erickson's 'Olympic' blackberry was an overwhelming success. Growers offered 'Olympics' at farmer's markets. Seattle's once and famous department store, Frederick & Nelson's, sold berries as a specialty item and went so far as to name a color after it. The local newspaper published recipes that featured it. A railroad even operated the "Route of the Big Berry" for a time. Unfortunately, the 'Olympic's' popularity began to fade when first Erickson and later Grieder were no longer able to keep up the farm. Today, only a few growers keep the 'Olympic' alive, but to those who know this berry, it is as delectable as ever. Sara Overton. "The Wonder Berry's Comeback." Puget Sound Enetai, 10 August 1984. "...the best and richest cherry..."
In about 1875, Seth Lewelling introduced another cherry, one that would become much more popular than the 'Black Republican.' He named it the 'Bing,' in honor of a Chinese foreman, Ah Sit Bing, who had worked for years at the Milwaukie nursery and who cared for the test rows in which the cherry was found. This cherry became famous for many reasons. It was nearly as large as any known, it was as tasty as the best of them, and it could stand shipping. Soon after the 'Bing' was introduced, the Willamette Farmer, a newspaper addressing agricultural topics, had this to say about it: "This cherry has some strong points. It is very dark throughout, is very rich and solid. Many of the cherries measure three and 1/3 inches in circumference. Can be transported almost any distance without injury, and will not bleed when the stem is removed from the fruit… Gentlemen present thought it is the best and richest cherry they ever tasted. A box of these cherries was a grand sight." Like it was more than 125 years ago, Seth's 'Bing' cherry is still one of the finest sweet cherries. U. P. Hedrick. The Cherries of New York. Albany, New York: Lyon, 1915. Once the premier sweet cherry, the 'Black Republican' was a large, dark-red cherry that was sweet and full of flavor. Pioneer nurseryman Seth Lewelling found this cherry in his nursery at Milwaukie, Oregon. It was a chance seedling that appeared in a row of familiar varieties including the 'Royal Anne.' Lewelling introduced it to horticulture in 1860, and for at least the next 65 years, experts praised it. For example, in 1915, U. P. Hedrick described the 'Black Republican' as "flesh purplish-red …tender, meaty, crisp, mild, sweet …of good quality" in The Cherries of New York. For the analytical Hedrick, that was high praise. The cherry's name reflects Lewelling's politics, or so the story goes. He found the cherry just before the Civil War. At that time, a 'Black Republican' was an abolitionist, and Lewelling honored the work of those who opposed slavery when he named this cherry. Today, the 'Black Republican' has nearly disappeared, but old-timers still remember it fondly, and a few trees survive. One of them is said to be the biggest cherry tree in Oregon, and one of the largest in the country. It is located in Owen's Rose Garden in Eugene, Oregon. About five years after Lewelling introduced the 'Bing,' Oregon had yet another first-rate cherry. Like the others, it appeared as a seedling in the Milwaukie orchard which, by then, belonged to Joseph Hamilton (J. H.) Lambert. He found the interesting seedling and grafted it to a 'May Duke' understock. About 1880, the crown of the tree died, and a new tree grew from the roots. Although it came from the understock, this new tree was clearly not a 'May Duke.' Moreover, it does not seem to have been identical to the original seedling. Where did this unique sprout come from? While rare, such goings on are not unheard of among tree fruits, which occasionally produce a "bud sport," a shoot or branch that is genetically different from the remainder of the tree. However it came to be, Lambert spotted the value of this new variety, and gave it his name. It remains popular today, since it still retains the qualities U. P. Hedrick described in The Cherries of New York as "tender and melting, sprightly, pleasant flavored, tart; of very good quality". Click here for image at Connell's Dahlia's website, then use your browser's "back" button to return to this page. Introduced in 1984 by Connell's Dahlias in Tacoma, Washington, 'April Dawn' is an informal decorative. Like many dahlias, these flowers have a domed shape, but with an interesting difference. On these flowers, the petals twist or curl just enough to make the bloom look casual, but never rumpled. The flowers measure six- to eight-inches, and have dozens of pointed white petals, each tipped with lavender. The plants are sturdy and grow about four feet tall. 'April Dawn' has racked up award after award. They include Derrill W. Hart medal for best performance in a test garden, the Lynn B. Dudley medal for highest average scores in shows, and the Stanley Johnson medal for largest number of show awards above a blue ribbon. Click here for image at the American Dahlia Society's website, then use your browser's "back" button to return to this page. Of the many choice dahlias with the "Camano" attribution, this one currently has the most awards including the prestigious Derrill W. Hart medal, awarded the best test garden dahlia. If that was not enough, 'Camano Choice' has been winning show ribbons for the better part of 20 years, and for good reasons. The big, 10-inch flowers have a dozen or more rows of rich lavender petals arranged symmetrically, like the other formal decorative dahlias. It is a sight to behold. Richard Ambrose of Camano Island, Washington developed this dahlia, and introduced it in 1981. To dahlia specialists, 'Gitt's Attention' is a small, formal decorative. To everybody else, it has 5-inch creamy-white bloom that are somewhat dome-shaped with rows and rows of petals that arch gracefully back. This one has an interesting trait - some of the petals fork at the tips, making the bloom fringed. Plants grow four feet tall with long stems. They are also good as a cut flower. It won the Derrill W. Hart medal for a the best test garden dahlias. Nicholas Gitts of Swan Island Dahlias in Canby, Oregon developed this dahlia and introduced it in 2000. Click here for image at the American Dahlia Society website, then use your browser's "back" button to return to this page. 'Fidalgo Bounce' was popular as a show dahlia in the late 1980s and early 1990s. The attraction here was part form, part color. The form part is easy. The five-inch flowers are known as "formal decoratives" to dahlia-folk. To everybody else, these blooms are domes with rows and rows of perfect petals. The color is more difficult to describe. It is a blend of yellow and pink, but it changes as it ages. Flowers start a dark salmon pink, with yellow showing on the backs of the petals and in the throat. As it ages, the yellow comes up, tinting the flowers soft orange. Richard Matthies of Fidalgo Island, Washington developed this dahlia, and introduced it 1978. 'Fidalgo Bounce' has received both the Derrill W. Hart and Lynn B. Dudley medals. Spend any time at all in the dahlia world, and you're sure to come across the gorgeous blooms of a Kenora dahlia. These plants, among them many award winners, were developed by Gordon Leroux, one of the premier dahlia experts in the U.S. He selected the 'Kenora' attribution in honor of his hometown in Canada. 'Wildfire' is a great big (10-inch) bloom, second biggest of all the dahlia classes. A fiery-red informal decorative, this one has rows and rows of pointed petals that stand straight out, giving it a spikey look. Among all the dahlias in its class, only one, the famous 'Spartacus,' wins more ribbons at shows. In other words, 'Wildfire' runs with the big dogs of the dahlia world. Gordon Leroux, of Gordon Leroux Dahlias, in Everett, Washington developed this variety and introduced it in 1989. It has won the Lynn B. Dudley medal for highest average scores in shows. Hulda Klager, the region's premiere lilac breeder, developed this deep-purple variety in her garden at Woodland, Washington and introduced it by 1928. It's double, deep purple flowers would be enough to dazzle most gardeners, but 'My Favorite' has an additon strength--the buds. They are so plump that just before they open, they look like a bunch of purple grapes. Another of Mrs. Klager's introduction, she developed this one at her home in Woodland, Washington and introduced it in 1928. Although officially classed with the purple lilacs, 'Ostrander' serves up a bouquet of color in each bloom. For starters, they are fully double -- each individual flowerette holds another one inside. And then there's the color. The outer blooms are a mid-range carmine-purple with an occasional touch of deeper purple. They open to reveal dabs of silvery-rose on the reverse of some inner petals. Put it all together, and the flowers are touched with light in ways rarely seen. It is rated in the top-dozen purple lilacs of all time. Yet another of Mrs. Klager's introductions from her garden at Woodland, Washington, this one dates from 1930. Lilac experts class it with the pinks, even though it is actually is so pink it almost looks rose. Although this variety is a single, it is known for its large blossoms, which are especially choice since so many other pinks are stingy bloomers. Those in the know rate it very fine to excellent. David Griffiths. "Some Hybrid Martagon Lilies." USDA Circular No. 299. Washington, D.C.: USDA 1933. Charles J. Gould. History of the Flower Bulb Industry in Washington State. Mt. Vernon, WA: Northwest Bulb Growers Assoc., 1993. When Oregon Trail emigrant A. R. Dimick came west, he brought potato seeds with him. It was not an ordinary thing to do. Potato seeds are unpredictable. They as likely to produce smallish, bumpy, bitter, or otherwise bad potatoes as anything else. Even today, hardly anybody grows potatoes from seed. They use a chunk of an existing spud, with an eye, and know that the potato that grows will look just like the one they planted. But Dimick had other concerns on his mind. Overland travel was no walk in the park. He knew he could take only so much stuff, and seeds had several advantages. They weighed much less than whole potatoes. They took up hardly any space. And when the going got tough, nobody was going to eat them. What he didn't know was just how good the seeds he brought west would turn out to be. When Dimick arrived in Oregon, he settled on a farm in the north part of Marion County. In the spring, he planted his potato seed. When he dug his potatoes in the fall, one of them was an exceptional spud. He kept the variety alive, and began to share it with other farmers. Eventually, it became hugely popular. Experts described it as the best potato raised in Oregon. Little else is known about this potato, except that the seed Dimick planted may have come from either an 'Early' or a 'Shaker Blue' potato. If true, the potato that many Oregon emigrants grew may not have been the familiar brown-skinned, white-fleshed spuds. They may have been blue on the outside, and blue on the inside. Hubert Howe Bancroft. The Works of Hubert Howe Bancroft. vol. 29, History of Oregon vol. 1, 1834-1848. San Francisco: The History Company, 1886. Dating back more than 200 years to the late 1700s, two surviving potato varieties, the 'Haida' and the 'Ozette,' may have been carried here by the Voyages of Discovery. Crews from some of these vessels used spuds as a trade item and showed some of the native peoples along the coast how to grow them. Indians liked the potatoes well enough to keep them going, saving two varieties that are thought to be very old. In the Queen Charlotte Islands, the Haidas grew potatoes that were about two or three inches long. The individual tubers vary in shape. Some are oblong. Others are egg shaped. Still others are nearly round. Many are knobby. They have medium brown skin, with a number of eyes. The flesh is waxy, and cream-colored. Dr. Nancy J. Turner, an ethnologist whose work deals with native peoples of British Columbia, writes that the potato was a staple crop for the Haidas by the mid-1880s. She says that "It was introduced along the Northwest Coast by some of the earliest white seamen. It was sometimes planted by them as a future food source, or was given to the native peoples with instructions on how to plant and harvest it." Turner also reports that the potato was an early agricultural commodity, traded with vessels and others on the land. Like the Haidas, the Makahs at Neah Bay in Washington grew potatoes. Their variety is known as the 'Ozette,' or sometimes 'Anna Cheeka's Ozette.' It is a fingerling potato, somewhat oblong in shape. The tubers range in size from three to eight inches, and occasionally grow together, forming zigzag tubers. They have beige skin with faint pinkish highlights. The tubers are circled with moderately deep eyes that are evenly spaced, making the surface of the potato wavy. The skin is thin, and the flesh is creamy white and waxy. Anthropologist Steven J. Gill reports that it was "...formerly grown at Ozette and by almost everyone at Neah Bay and supplied to schooners by local residents." The Makah have been growing it for so long that some consider it a traditional food. Steven J Gill. Ethnobotany of the Makah and Ozette people, Olympic Peninsula, Washington. Ph. D. diss., Washington State University, 1983. Nancy J. Turner. Food Plants of British Columbia Indians, Part 1, Coastal Peoples. British Columbia Provincial Museum Handbook, No. 34. Victoria: British Columbia Provincial Museum, 1975. In 1909, Portland Seed Company introduced a potato that went on to set a record for productivity. In their 1921 catalog, they described this baking variety as follows: "…of the ideal elongated type with smooth, thin white skin, eyes shallow; flesh snow white, of finest table quality; flowers white, vines medium large of bushy growth, withstands drought; and is blight and disease resistant to a remarkable degree." Named 'Pride of Multnomah,' this spud took the California record for yield, producing a whopping 790 bushels on an acre plot at the Panama Pacific Exposition in 1915. Compared to modern growers, who average 360 to 364 cwt (hundredweight) to the acre, the yield at the PPE by the old 'Pride of Multnomah, ' which produced 474 cwt, is still a knockout. Portland Seed Company catalog, 1921. In the 1930s, a Canadian gardener on Vancouver Island selected a primrose with several outstanding qualities. These 'Cowichan Primroses' were a velvety deep purple-red color, and since they had next to no eye, the color was especially intense. In addition, the leaves, which are typically grass-green in primroses, were tinged red. Thompson and Morgan Seed Catalogue, 2000, p. 132. Click here for image at the Oregon State University website, then use your browser's "back" button to return to this page. For most of the year, this hybrid is a handsome evergreen, with fern-green leaves that measure about eight inches long. But come May, this rhody is transformed into the amazing pink thing. Generous clusters of rosy-pink flowers with a few darker flecks cover the plant. Theodore Van Veen, Sr. of Portland, Oregon developed this variety and William E. Whitney of Brinnon, Washington introduced it in 1954. The ARS rates it 5/3. It received an Award of Merit from the Royal Horticultural Society in 1987. Mr. Whitney received the American Rhododendron Society's Gold Medal posthumously in 1975. Sonja Nelson and Portland Chapter American Rhododendron Society. 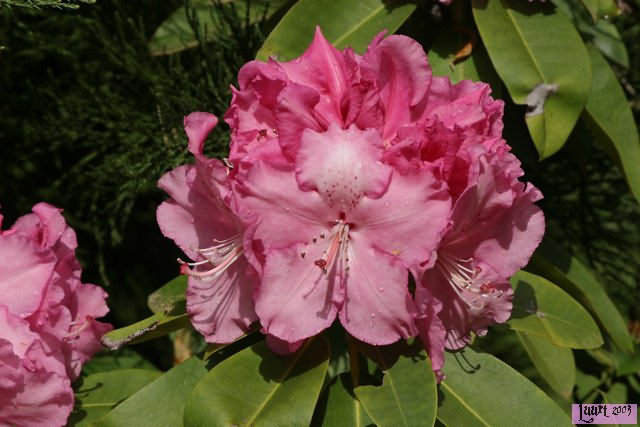 The Pacific Coast Rhododendron Story: The Hybridizers, Collectors and Gardens. Portland: Binford & Mort, Publishers, 2001. Homer E. Salley and Harold E. Greer. Rhododendron Hybrids, 2nd ed. Portland: Timber Press, 1992. This extraordinary rhododendron has two outstanding qualities--flowers and form. 'Hotei's' flowers are literally as good as they get. They are a pure, butter yellow with throats that are a shade or two darker. The trusses are large, made of about twelve flaring flowers with ruffled edges and yellow stamens. And then there's the plant --compact mounds of five-inch leaves that are rich, dark green. 'Hotei' grows just three feet tall in ten years. Karl Sifferman of Seattle, Washington developed this variety and Ben Nelson of Bainbridge Island, Washington introduced it in 1969. The ARS rates it 5/4. It recevied an Award of Merit from the Royal Horticultural Society in 1974. Mr. Nelson received the American Rhododendron Society's Gold Medal in 1966. Click here for image at the Arboretum Trompenburg website, then use your browser's "back" button to return to this page. A masterpiece and a living legend among rhododendrons, 'Lem's Cameo' flowers display a range of colors, from soft yellow in the throat to cream in the petals to pink and apricot at the edges. If that was not enough, each bloom has just a touch of scarlet above the stamens. The flowers, held in generous trusses of about 20, have generous, flaring petals with wavy edges. These flowers are good enough to make this hybrid memorable, but there's more. The leaves are red when they emerge, then fade to a deep green. Halfdan Lem of Seattle, Washington developed this variety and introduced it in 1962. The ARS rates it 5/3. It won a Superior Plant Award from the American Rhododendron Society, 1971 and an Award of Merit from the Royal Horticultural Society in 1987. Mr. Lem received the American Rhododendron Society's Gold Medal in 1963. Could not find an image on-line for this variety. It's the red blotch on this hybrid that is shaped like a butterfly, though you'll probably have to study a flower for a moment to get the reference. The flowers are a rich rosy pink, slightly darker around their ruffled edges. They appear in great big trusses in late May. Leaves are dark green, just a shade or two towards yellow-green. Resists those pesky root weevils. John G. Lofthouse of Vancouver, B.C. developed this variety and introduced it by 1981. The ARS rates it 5/3. Mr. Lofthouse received the American Rhododendron Society's Silver Medal in 1999. Image: Couldn't find one online. Of the red rhododendrons in the nursery trade, this one is a real show stopper. Red buds open to bell-shaped flowers that are a vibrant cherry red with a few black flecks. They appear in late April or early May during the astrological sign of Taurus. Thick, insect-resistant leaves that are dark green cloak the branches. Fred Mossman of Vancouver, Washington developed this variety and introduced it in 1972. The ARS rates it 5/4. Click here for image at the Portland Chapter, American Rhododendron Society, then use your browser's "back" button to return to this page. A grand and glorious pink rhododendron that set a new standard of excellence. Size is just one of the qualities that set this hybrid apart. These flowers are huge. They are also a fine pink, and often show a few white markings. Keeping pace with the flowers, the leaves are also large, and have a slight twist that makes them the perfect counterpoint to the hefty trusses. Harold E. Greer of Eugene, Oregon introduced this variety in 1961 The ARS rates it 5/4. It received a Superior Plant Award, American Rhododendron Society, 1971 and was the first rhododendron to receive this prestigious award. Mr. Greer received the American Rhododendron Society's Gold Medal in 1989. Special Medal, City of Portland. 'Columbia' was a hybrid tea with long-stemmed, fragrant pink flowers that turned a shade or two deeper pink as the bloom opened. In addition to its handsome flowers, what made it special was the number of blooms it produced--up to 225 in a single season. 'Columbia' was not an Oregon original. It came from Richmond, Indiana, where amateur grower E. G. Hill developed it as a hot-house variety. All that changed when growers tested 'Columbia' in trials at the Portland International Rose Test Garden. In head to head competitions against 33 of the most promising new roses in 1917 and 1918, 'Columbia' out-grew and out-bloomed its rivals. Judges awarded it more points, 98-2/3 out of 100, than any other rose in the Portland International Test Garden had ever received. A floral superstar was born. The year it was introduced, 'Columbia' sold a whopping 484,000 plants, and within two or three years, sales totalled more than 800,000 plants. The Sunday Oregonian, 19 Jan 1919, p. 20. A lovely, satin-pink rose with a delicate fragrance, 'Mm. Caroline Testout' is a hybrid tea developed in France in 1890. At the time, hybrid teas were a new and trendy class of roses. Before 1872, when the first hybrid tea, a rose called 'La France' was introduced, gardeners relied on hybrid perpetuals, Chinas, and others that are now called old garden roses. But when hybrid teas came along, gardeners couldn't get enough of them, and for good reasons. The hybrid teas had several strengths. They bloomed again and again all summer. They had long, pointed buds. They had handsome blooms with rows and rows of petals. It was no surprise that Portland's new rose festival would select one of the most popular of these hybrid teas as their official rose. Growers there planted thousands of them in public and private gardens, parks, and even in parking strips. In 1902, civic boosters went from house to house encouraging everyone to plant at least one 'Mm. Caroline Testout,' according to an article in The Oregonian. They also lined streets with this variety. For example, Sellwood Boulevard was lined with this rose. Some of them survived until at least the mid-1960s. Eve Stevens, "City Urged to Encourage Planting of Official Portland Caroline Testout Rose," TheOregonian, 3 June 1965, p. 14. In about 1917, Clark County pioneer John R. Spurgeon (1882-1965) developed a new walnut with at least two interesting traits. It broke dormancy later than most, thus protecting it from late frosts and rain. And it produced larger-than-average nuts with fine flavor. Problem was, hardly anybody noticed. Spurgeon spent the next 40 years trying to drum up interest in this walnut, but he didn't have much luck. It wasn't until after he retired that officials with the Oregon-Washington Nut Growers Association finally recognized this variety. By then, Spurgeon had sold out to J. B. Bruce, who was much more successful at promoting this unusual walnut. Today, several nurseries still offer the 'Spurgeon' walnut, recommending it for the same reasons that Spurgeon recognized decades ago. "John Spurgeon, Developer of New Walnut of Northwest, Dead at 83." The Columbian, 29 Nov. 1965, p. 21.